Heat the oil in a small frying pan - around 21cm across. Add the garlic and chillies and let them sizzle merrily for a few seconds. 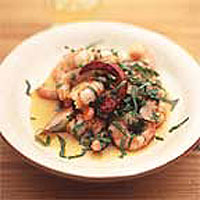 Just as the garlic is beginning to take on a hint of colour, add the prawns and stir carefully. Cook for a further 2-3 minutes over a high heat, until the little prawns are a juicy, cooked pink. Draw off the heat, quickly sprinkle over the parsley or coriander and serve at once, still sizzling.